The 2019 Forest River Cedar Creek Champagne 38EL is ultra-reliable and built for the long haul! This 5th Wheel is the perfect choice for camping lovers, with its abundance of wonderful amenities! You can find this model and other quality RVs at wholesale prices at National RV Detroit! We've been guaranteeing the nation's best prices since 2008! You can visit our site at 44700 N I 94 Service Dr Belleville Michigan 48111, or we can bring the Cedar Creek Champagne 38EL to you with our 24/7 delivery service across North America! So give us a call today at 734-439-3400 to start your RV adventures! 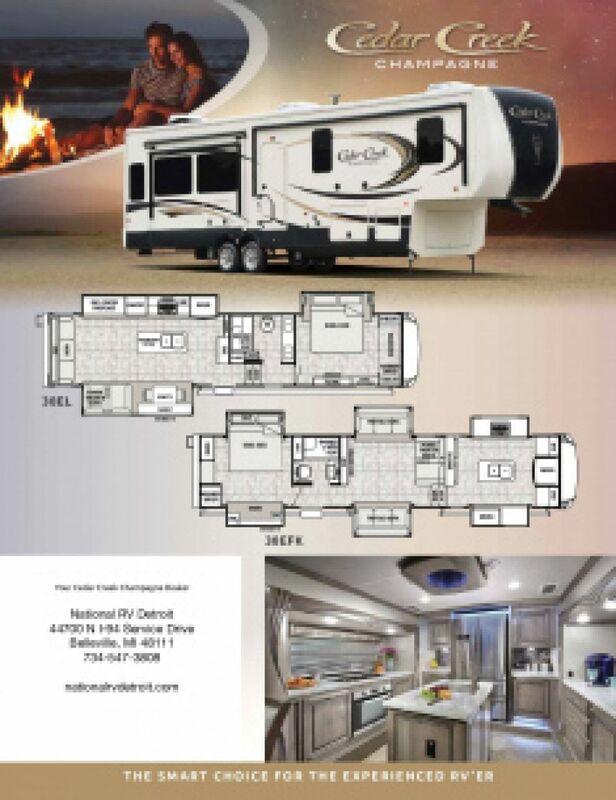 This Cedar Creek Champagne 38EL is built for easy, comfortable living on the road! 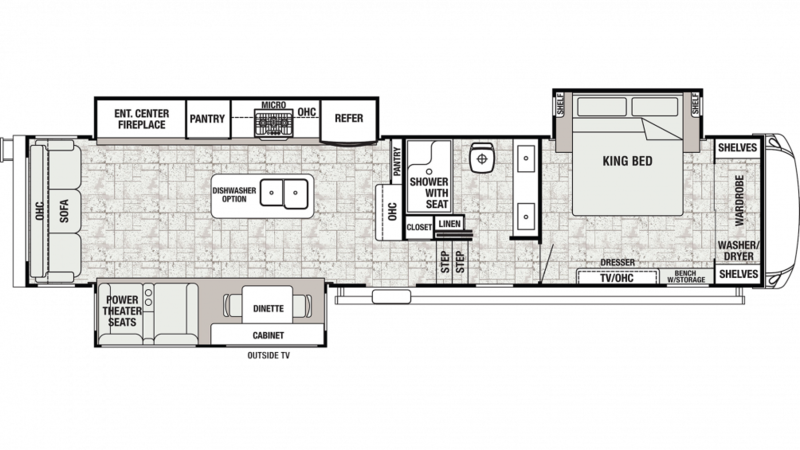 It's a roomy 41' 7" long, 8' 0" wide, and comes with 3 slideouts that maximize living space inside! And when the weather outside isn't cooperating you can use the efficient 40000 BTU furnace to stay cozy and warm, while the 15000 BTU a/c unit will keep everyone cool and comfy when it's sizzling outdoors! After a long day of outdoor adventures, you'll probably be tuckered out and ready for bed! Enter the master bedroom and fall onto the King bed for a good night of uninterrupted sleep! A family of 4 can find somewhere cozy to sleep inside this RV! Enjoy something different from the campfire food and restaurant chain offerings with the kitchen in this 5th Wheel! Cook up tasty meals on the 3 burner range cooktop, and store fresh food in the 20.00 cu. ft. refrigerator! The sink offers plenty of clean water from the 57 gallon fresh water tank! Nothing feels more like home than a lovely private bathroom in your RV, instead of traipsing to the damp, chilly, often messy campground community bath facility! That's what comes in this 5th Wheel! You'll love having a roomy shower, full sink vanity, and convenient Porcelain Foot Flush commode! And with the big 57 gal. freshwater tank and LP tank capacity of 60 lbs, there'll be hot showers for everyone! This RV also has a 80 gallon gray water tank and a 40 gallon black water tank.